The laminate version of the display is shown at venues in the US and abroad. 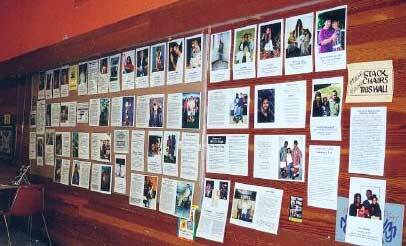 A laminated photo display is a versatile way for anyone to show the faces of prisoners of the US Drug war and their families. Educational pieces explain drug policies, conspiracy, mandatory minimum sentencing, criminal penalties, and Human Rights law. Click on the photo above to learn more. In a photographic essay, the public sees the actual faces of people filling American prisons today and learns the case histories of selected inmates whose sentences illustrate the often harsh and arbitrary policies imposed on first-time, non-violent drug offenders. The photos show many of the prisoners with family members, leading the viewer to the realization that incarceration does not only affect the person convicted of a drug crime, but also their family, friends and society at large as well. Through charts and statistical data, the public is informed of the price tag of incarceration and the overwhelming growth of the prison industry. The exhibit demonstrates that the Drug War is an "unwinnable war" with high social and financial costs to the American people. Most important, the display puts a human face on a war which is almost always depicted as a grim, faceless war that must be fought despite all the evidence of failure. Through these media, a moving portrait is painted of American drug policy which compels its audience to stop and ponder, "How many lives will be destroyed and how much money will be spent by the US policy of waging war against its own people." It asks viewers to look into their hearts to help find more just solutions to the Drug War.